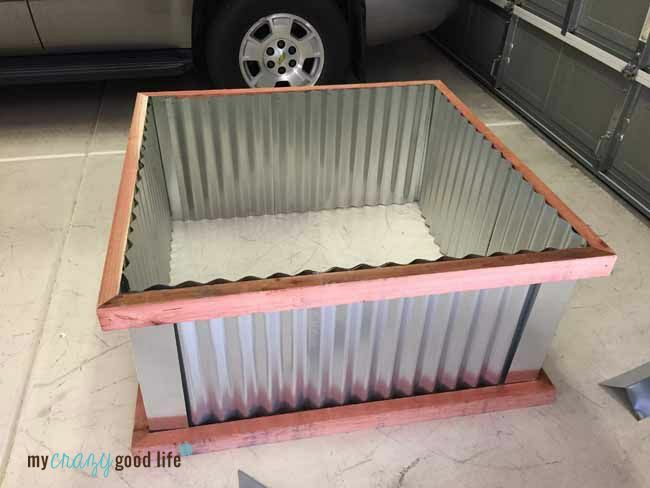 A few months ago my darling husband decided to appease my spontaneous idea of a garden (though historically, I have a very black thumb) and went a step further to build me a few beautiful DIY raised garden beds with corrugated metal and redwood. 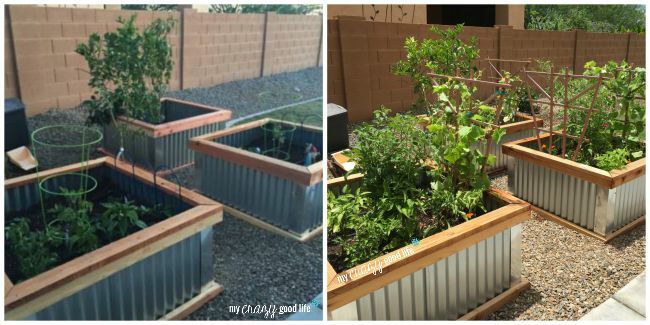 I’ve had so many people ask for the details about these garden boxes and how he made them that I decided I had to share them here! Growing our own vegetables is one of my favorite hobbies. I love that I can see them grow from seed to food and especially love that I know exactly what goes into them. I love when the kids (and sometimes the dogs…) pick snacks from the garden and I especially love going out with a big bowl before dinner and grabbing ingredients. 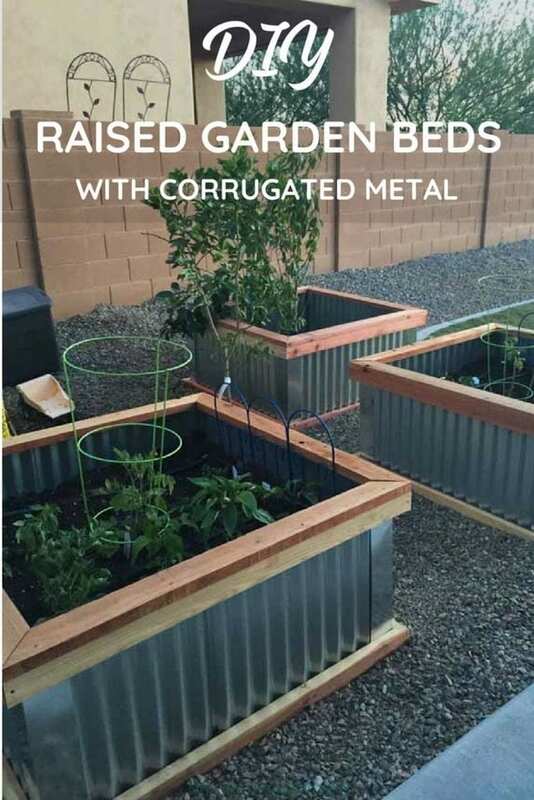 2 – 4′ x 8′ pieces of corrugated metal or this Corrugated Garden Bed Kit (click here to buy on Amazon) if you’re unable to cut the metal. The garden bed kit is a convenient raised garden bed kit on amazon. It has short sides–it’s 10.5 inches deep and is just over 3 feet long. 4×4′ chicken wire (click here to buy on Amazon) for the bottom of the box. This is used to prevent animals from tunneling under the box. 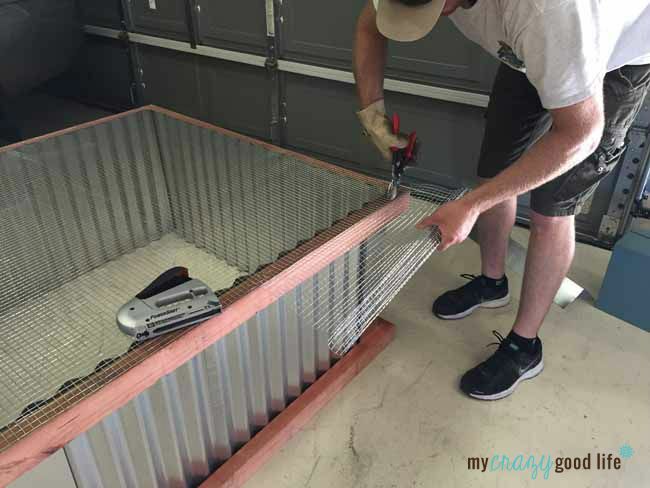 Cutting the corrugated metal was definitely the toughest part. You’ll need two people to do it, and safety glasses are a must. We purchased a blade for the skill saw (click here to buy on Amazon) specifically used for cutting metal. These aren’t the most cost effective boxes you can make, but they’re beautiful! Each box cost us approximately $100. You can use different wood to get the price down. The corrugated metal has to be vertical for structural purposes. 1. Cut your supplies. 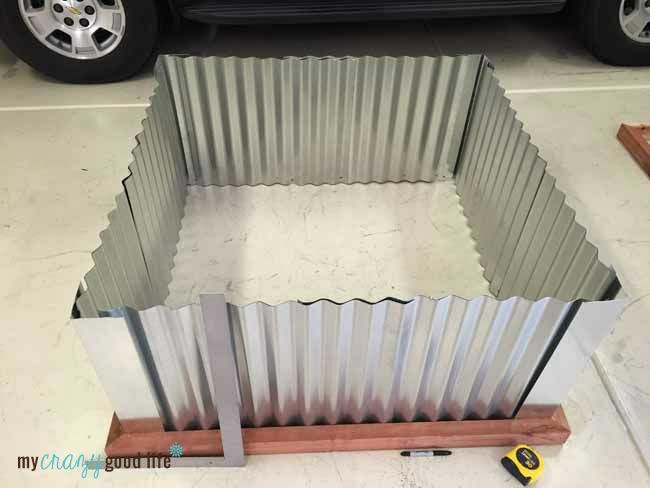 You’ll need to cut the corrugated metal and metal flashing into four 22″ sections, the redwood for the box into eight 48″ sections, and the redwood for the decorative top of the box into four 48″ pieces that are ripped in half (cut in half) to make it look a little nicer. Remember, we did not use pressure treated lumber but you’re welcome to. 2. 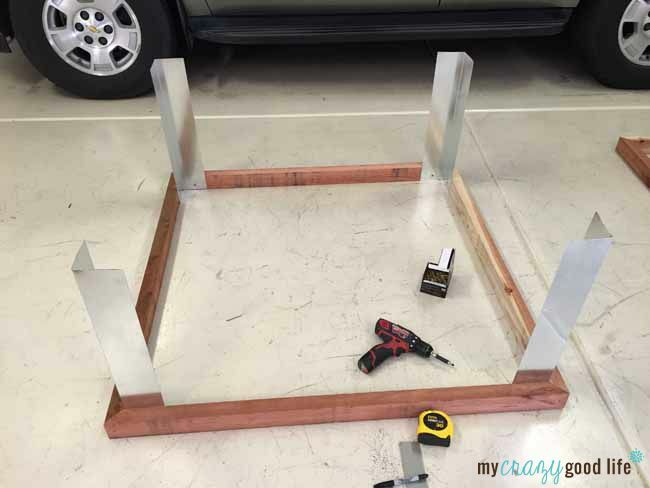 Use four of the 2″ x 3″ x 4′ pieces of wood to make the bottom frame of the box. Once we cut the corners to fit together, we used deck screws to secure them together. To prevent your wood from cracking near the ends, drill pilot holes before using the screws. 3. Next, we fastened the metal flashing to the corners of the bottom frame of the boxes. This was definitely easier to do with two people. 4. Now for the corrugated metal. Again, easier with two people. Steve sat inside the box while I sat outside with a right angle, making sure the metal was straight before he screwed it in place. 5. After securing the corrugated metal, we flipped the planter over so the metal fit just inside of the other box frame. We secured that with deck screws. 6. Optional: Secure the chicken wire to the bottom of the box with a staple gun. Again, we did this to make sure no animal could tunnel under the boxes. 7. Flip the box back over and secure the top decorative frame to the box. This makes the box a bit more polished and gives you a place to sit or place your garden supplies. After securing the top, we carried the planter outside and pulled our drip tube through the chicken wire. 8. We filled the boxes with garden soil, making sure the drip tube stayed at the top. 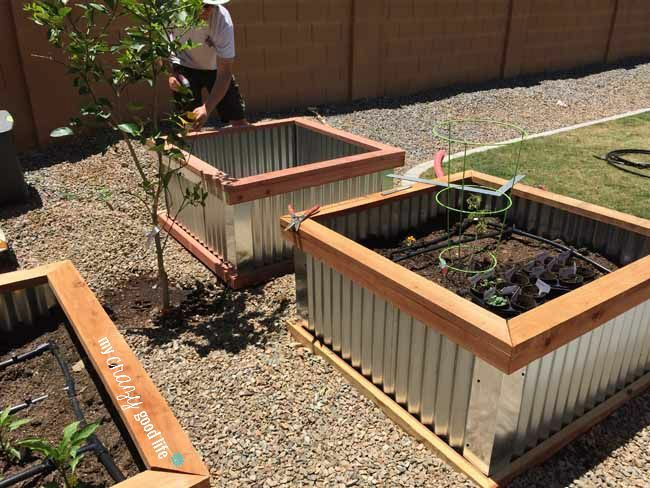 After you build a raised bed, you should ideally wait a day or two before planting seeds. You might think about which soil amendments (if any) you’d like to add, and plan out which plants will be best in the same box. If you’d rather not fill the entire garden bed with soil, some people like to put recyclable items at the bottom of their garden box first–empty milk containers, cardboard boxes, bottles, etc. This allows for better drainage and costs less money in soil. Remember that after your garden box is filled with soil it’ll compress a bit. I’d wait a day or two and fill with some more dirt before you start planting. If your beds need some shade, you can use a small garden trellis on each side and adhere landscaping fabric to each side, making a shade for your plants. I’ve found that tomatoes love the shade. We were gardening newbies when we started, but I have to say that I think we’ve done a pretty good job in the last few months! 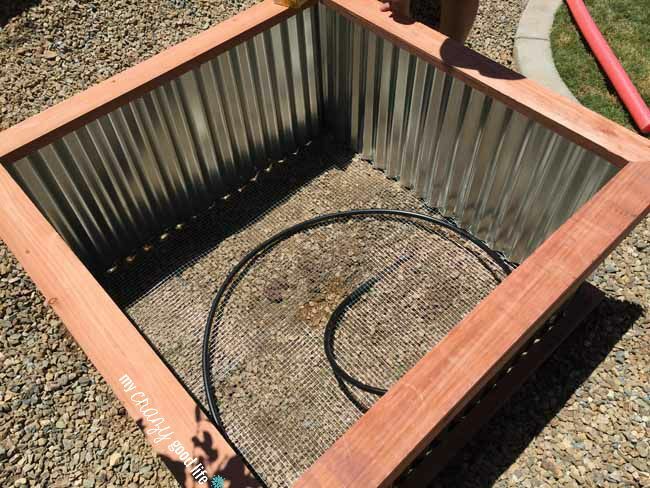 This garden bed project is one of the most fun DIYs we have done–you can use them for a herb garden, a glower garden, or a traditional vegetable garden and they’re pretty easy to build. These beds are not rot resistant, but we have not had any issues with this in the years that we have had them up–they’ve helped us grow a ton of vegetables and they’re so easy to plant in every year. 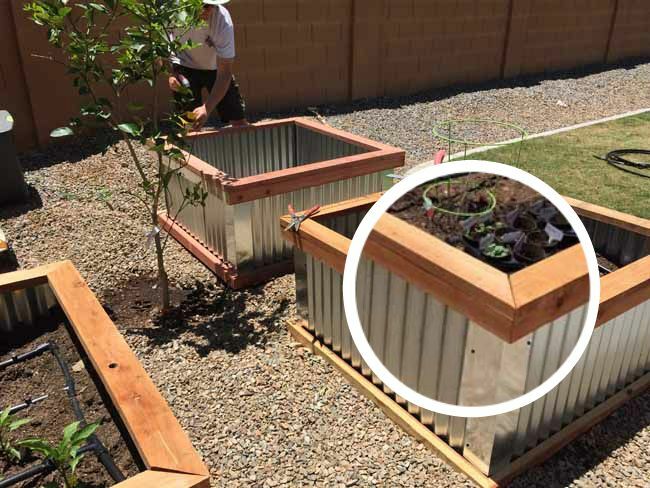 Does the corrugated metal heat the soil in the boxes? We have been asked this question a lot, and despite living in Tucson where the weather is hot and dry, we haven’t had an issue with the soil getting too hot. 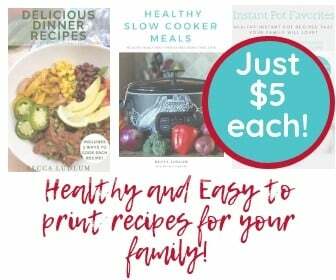 We have had great success growing many different types of herbs and vegetables in our raised bed garden boxes and wouldn’t do anything different if we built more down the road. What have you grown in your raised bed garden? We love growing tomatoes, zucchini, cucumbers, green beans, strawberries, carrots, and have had awesome luck with hot peppers. Last year we dedicated one garden box to just peppers–jalapeños, serranos, cayenne, and Carolina Reapers. I think hot peppers grow better when they’re together in a garden box. We have grown one pepper plant in a box with other vegetables and it didn’t do nearly as well (or get nearly as hot) without the other peppers.